Be aware of the False Prophets! Are you concerned about false prophets today? In what ways have you seen false prophets switch “gates” (Matthew 7:13-20) on you, claiming lies as truth? How do they make them seem attractive? False prophets will switch the gates on you and claim lies as truth. They are denying who and what Christ has done for you and replacing the truth with lies! They seem attractive at first, until you realize you have been shamed, hopefully before it is to late. The warning to the follower: Because even though you may have been misled, you are still responsible for your choices! What did Jesus say about them? 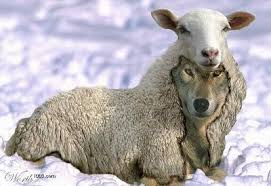 He called them “Wolves in Sheep’s clothing,” and where we get this phrase, as the phrase is quite true! It is saying and representing what is not really what you intend or mean to deliberately misreport truth, even though you may believe it as true. What did the Jews feel about false prophets then? Most Jews did not accept any new prophets after the Maccabees (time after Daniel, 175-135 BC) period (Jer. 2:8; 5:30) and considered all who claimed to be a prophet as false. Josephus (first century Roman historian) lists many, during Jesus’ times, who attracted the crowds, but were soon flushed out as vicious wolves. How do we know a False Prophet? We can know them by their character, by how they live (Matt. 7:21-23; Luke 6:43-45), and if their words come to pass (Duet. 13; 18:21-22). Do they live by faith, humility, Fruit of the Spirit or by pride, arrogance, extravagant living. Do they point to themselves or to the Work of Christ? They will have the spotlight, because humility prevents those who are godly from promoting themselves. The only way you can tell is to know the truth from the Bible, watch them closely, and test them (Gal. 1:8-9; 1 John 4:1). In addition, know this: their lifestyle and character will soon give them away (2 Cor. 8:20-21; 2 Tim. 2:14-16; 3:13; 2 Pet. 2:1-3). They will lead you astray and must be corrected. If they refuse to listen (Matt. 18), they must be silenced. They are slick and tickle people’s years. False teachers will rarely come across as the evil type, with shifty eyes and whispers in the dark. They come with fancy suits, flashy cars and eloquent, emotional, and attractive speeches to captivate you. They will have large ministries because what is false is what is attractive. As people will give them money, thinking they will get a greater return which will never happen. They will also cause divisions, strife, and lead people away from the True faith (1 Tim. 1:3; 6:3-4; 2 Tim. 2:18; 2 Pet. 2:1). They usually will not teach, but just give off emotional rhetoric and grandstanding, pointing to themselves rather than glorifying God. Or, they will mix in truth and falsehoods to confuse you, as most Christians have not been discipled, and therefore cannot discern the difference! Heresy is not about interruptions and opinions. It is about adding to the Bible what is not there, or taking away from what is there. This is very destructive, both personally and collectively, to a body of Believers (Rev. 22:18-19). The only way you can expose a false prophet is to know the true Truth from the Bible, watch them closely, and test them. Do you believe that a lot of pastors, especially the ones on TV, need to be “set straight,” as we have so much false teaching in the church, adding what is not there and letting people far away? Concider this, when we take away essential truths of the faith, and believe what we want, how would this grow your faith and your church? Think about how does this neutralize the Majesty and holiness of Jesus, His teachings, how much we have been forgiven, and cheapen His Gospel?